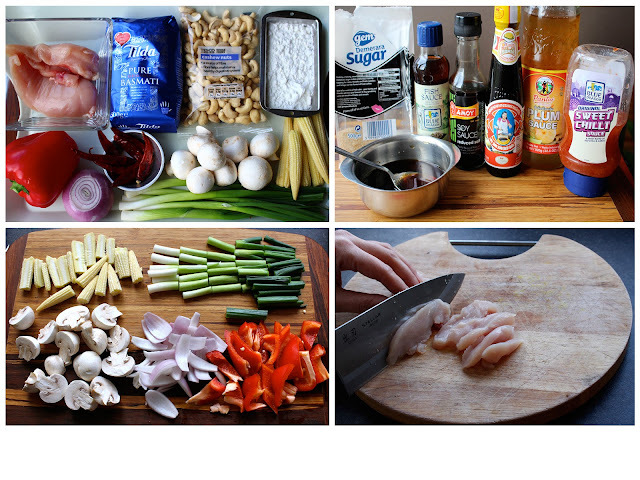 Cooking with Vân : Thai chicken cashew( serve 4). Chicken is one of the most favourite dish in my classes and it is so easy to make once. I always use raw cashew nuts and roast it in the oven to avoid using too much oil like the the original Thai recipe over internet. 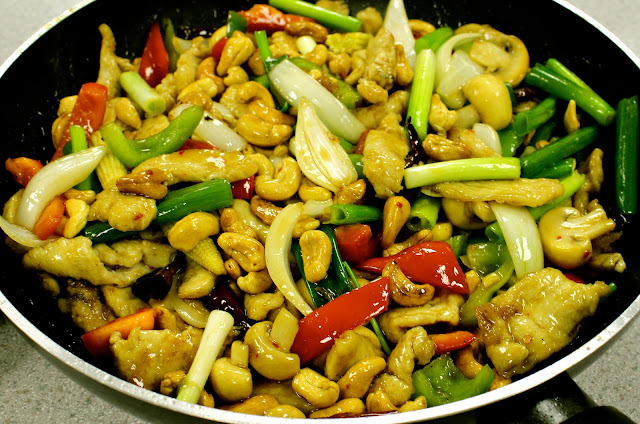 The main character for this dish is the savory chicken blends nicely with the crunchy cashew nuts and the crunchy veggies. The dried chili gives it that smoky spiciness and it's addictive. 2 chicken breasts ( slice into thin strips). 1 cup mixed red/green/yellow peppers( thinly cut). Half onion( cut into bite size, along the grain). 4 baby sweet corn( cut into strips). 5 dried whole chili ( remove seeds). 3 spring onions( cut into 1 inch). 1 cup roasted cashew nut. Fish sauce, oyster sauce, soy sauce, sweet chili sauce to taste. .Heat up the oven to 220 degree. 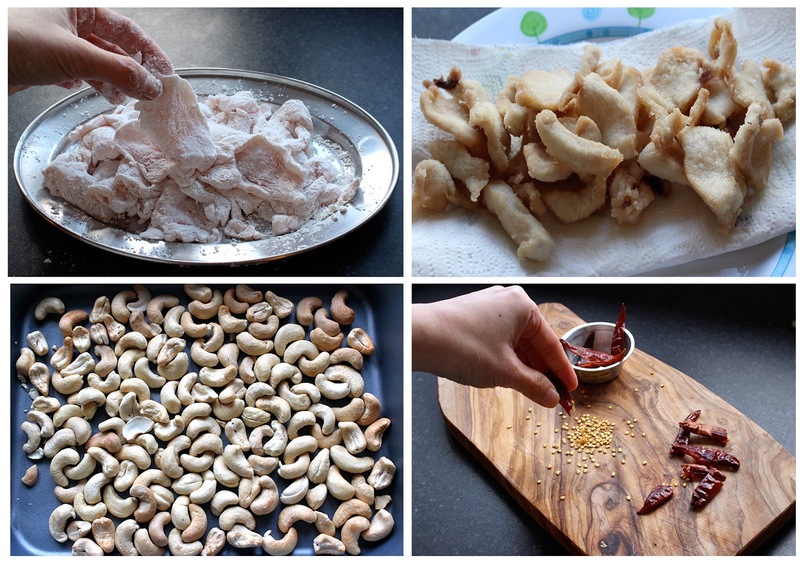 Place the cashew nuts on a baking tray and put it in the oven. Turn off the oven right away and leave the cashew nuts to be roasted slowly for 10 minutes. Slow roasting this way will make the nuts crunchy and retain its beautiful flavour.
. Sprinkle 2 table spoons corn flour to coat the chicken. Heat ½ cup of cooking oil and fry the chicken for 3 minutes until cooked at medium high heat. Set aside.
. Mean while in a small bowl combine 2 table spoons fish sauce, 1 full table spoon sugar, 2 table spoons oyster sauce ( Thai oyster works best), 2 table spoons soy sauce and 1 table spoon sweet chili sauce( plum sauce optional). Mix well. .Add 2 table spoons cooking oil to the frying pan and heat up. Toss the dried chili in quickly to infuse the oil. Add in peppers, mushrooms, baby sweet corn and stir well for 3 minutes. 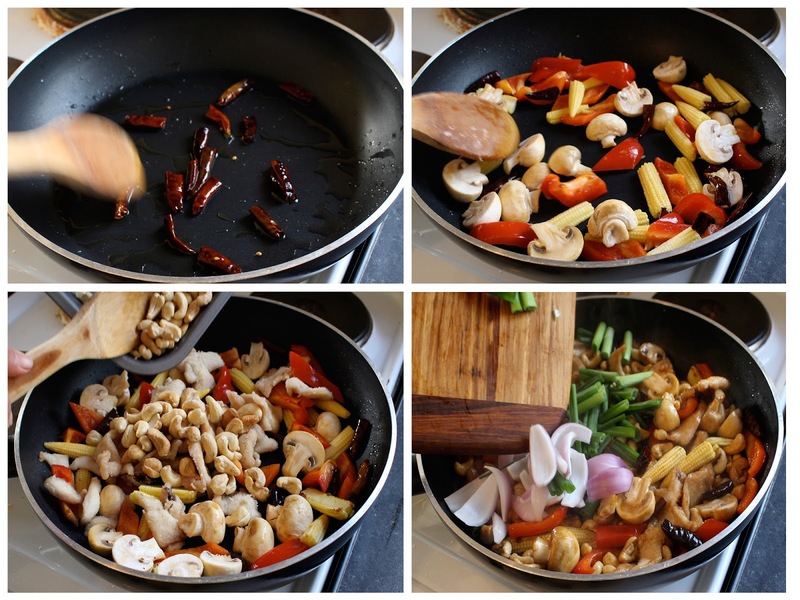 .Add in the chicken, cashew nut. Toss well then slowly pour in the seasoning bowl and mix well. Cook for 3 minutes and add onion and spring onion. Mix all together for 2 minutes and it's ready to serve.